Wooden Villas Manufacturer in Delhi, Wooden Villas Suppliers in Delhi, Wooden Villas in Delhi. We hold expertise in providing the beautiful design of Prefabricate Wooden Villas in Delhi with wide varieties. These unmatched constructions are high in demand and are made of strong wooden materials (Pine, Spruce, Cedar, Larch). All our raw products are sourced from certified vendors and are designed in innovative varieties. We work in close coordination with our clients and provide highly strong constructions at the reasonable Quality price range. If you care for our Environment you should not make any compromise on money for the Luxury. Our Wooden Houses which is manufactured by us gives you the solution to which World has Contributed to Save the Environment. Build An Eco-Friendly Wooden Green House for yourself. We have many features are wooden villas in Delhi but some of them are:- High Durability, Low aptitude for deformation, Natural & Eco-friendly. 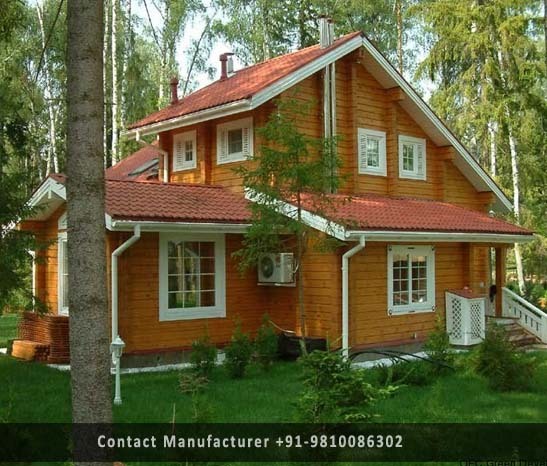 We are instrumental in providing the best designs of Wooden Villas in wide varieties. We hold expertise in providing the most attractive and reliable constructions using high quality Wooden components. Our employees are Well Trend to work in close coordination with our clients to provide them best constructions at the most Quality price range. • Withstand stronger earthquake without permanent deformation. • Medical healing power to cure many diseases. We are also manufacturing all type of tensile structure and supplying in india and abroad. As prefabrication, modularization and ON-site construction techniques in Delhi. We are working on turnkey projects in Delhi.